Diane Keaton is one of my favourite celebrities for a variety of reasons, the main one being her authenticity. (I once was amazed to find myself sharing an elevator with her at the old Four Seasons Hotel on Avenue Road in Toronto on my way to our company Christmas party.) I never miss attending her new movies as soon as they’re released. She’s had a few clunkers for sure but Annie Hall was her zenith. I’ve watched that movie so many times I can almost recite the dialogue from start to finish. Sadly, her latest movie And So It Goes co-starring Michael Douglas is, in my opinion, a clunker. Keaton’s movie characters always tend to be a variation of herself with her insecurities, unfulfilled ambitions and a wardrobe of soft cashmere sweaters and tailored blouses. And with Rob Reiner as producer and also playing a minor role in the movie I expected better. 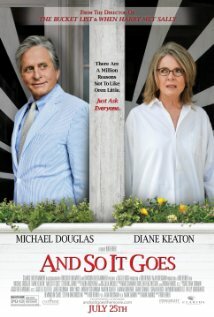 And So It Goes is the story of a sleazy real estate agent played by Michael Douglas who was recently widowed and is selling his own multi-million dollar family home. He temporarily moves into a tired-looking rental unit in a waterside four-plex he owns until his own home sells and he’s ready to move to Vermont. Keaton plays a widow who lives in the adjoining unit. Douglas’ estranged, now-clean formerly-addicted son turns up unexpectedly with a 10-year-old daughter and wants Douglas’ character (who didn’t even know he had a granddaughter) to look after her while the son does a bit of jail time. Grumpiness ensues for Douglas followed by romance and ultimately a predictable happy ending. The dialogue was trite; the premise a bit silly and all in all not worthy of Keaton, Douglas or Reiner. Try harder next time, guys. We know you can do better. Thanks for this Lynda. I was looking forward to a great movie!!! Too bad it doesn’t meet the audience expectation. I’m not actually “the audience” – just a subjective opinion by one person.